Is Emma Coronel Aispuro Lesbian ? The Mexican-American Beauty Queen Emma Coronel Aispuro is widely known for being the wife of billionaire drug lord El Chapo. Her husband is the head of the Sinaloa Cartel and is currently waiting for his trial in a Manhattan jail. She was crowned Coffee and Guava Queen in 2006 after winning a pageant over four other contestants and in her coronation moment, El Chapo brought three bands to celebrate her win. Emma Coronel Aispuro was born to Ines Coronel Barreras and Blanca Estela Aispuro on July 3, 1989, in San Francisco, California, United States. She was raised along with her brother Ines Omar Coronel Aispuro in a small village named La Angostura. Her father Ines Coronel used to cultivate marijuana and worked with a drug mafia lord named Ignacio Nacho Coronel Villareal. Emma Coronel Aispuro is a Mexican-American beauty who came into the limelight after being involved with a drug lord named Joaquin "El Chapo" Guzman. It was in 2006 when she took part in the Local Coffee and Guava Festival which took place in Canelas, Durango. During the pageant, all the contestants had to throw a party on a particular day and Emma was scheduled to host a party on Three Kings Day. It was El Chapo who threw a huge party with hundreds of armed men and at the party, he announced his marriage to Aispuro. Eventually, she won the pageant against four other contestants and was crowned Coffee and Guava Queen. 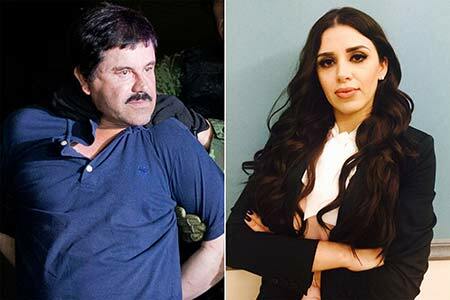 Emma Coronel Aispuro and husband El Chapo. In her coronation day, she was treated as a queen by her would be husband by bringing three bands to celebrate her crowning moment. The beauty queen Aispuro lives a luxurious life as her husband who is a billionaire is estimated to have a net worth of $4 billion. He was ranked fifth among the top 11 richest Drug dealers of all times. As a leader of the Sinaloa Cartel, he managed to earn a huge income. Emma Coronel Aispuro is married to a drug lord named El Chapo with whom she tied the knot on July 2, 2007. The couple first met at a party thrown by her father in 2006 and they soon came close and fell in love. Her father was one of the drug lord's top deputies and they knew each other pretty well. The couple was deeply in love and gave birth to twin daughters Emali Guadalupe and Maria Joaquina at Antelope Valley Hospital in Los Angeles at 3:50 pm in 2012. Her children were made American citizens according to Jus Soli rule which states the children's nationality will be of the place where they are born. El Chapo's name is missing from his twin daughter's birth certificate since he was a wanted criminal that time with a huge bounty of $5 million on him. Before marrying Aispuro, El Chapo had already married four women and was the father of several children. Most people say she was blinded by love as he was 30 years older than her. She gave an interview related to her husband on January 8, 2016, in the exclusive Telemundo interview which was conducted by Anabel Hernandez. The whole interview program was titled La Reina de El Chapo which means The Queen of El Chapo in English. During the interview, she begged for justice for her husband El Chapo and told that his life is in danger in prison. Her husband was arrested in his hideout in 2016. After the mafia lord Ignacio "Nacho" Coronel Villareal who formerly ran the Sinaloa Cartel was killed in a shootout with the Mexican Security forces in 2010 the cops started investigating all the drug mafias. After the incident, her father along with her brother Ines Omar Coronel Aispuro was arrested by the United States Department of the Treasury under the Foreign Narcotics Kingpin Designation. They were captured for their involvement in drug trafficking operations and sent to prison in 2013. The following year after her father and brother's arrest her husband was arrested for drug trafficking in 2014 but without getting the punishment for his crime, he escaped prison in 2015 through a tunnel. He used to hide in the mountains making it his hideout and begged many big celebrities to help him. But after his location and whereabouts were traced the Mexican army raided his house and was again arrested in 2016. Since he was a wanted criminal in both Mexico and The United States he was charged with several cases of drug trafficking, money laundering, kidnapping, and murders. His lawyers are still fighting for his justice and in the trial of 2017 he pleaded not guilty to the judge and is ordered to appear in the court for his trial on September 5, 2018, which later postponed to November 5, 2018. The couple married in a private ceremony on July 2, 2007, surrounded by armed security guards all over. They have twins children born in 2012. El Chapo and Emma Coronel Aispuro gave birth to their twin daughter Emali Guadalupe in the year 2011. El Chapo and Emma Coronel Aispuro gave birth to their twin daughter Maria Joaquina in the year 2011.